Günther Steinhausen was born on 15 September 1917 at Lobkevitz on the Island of Rügen. Steinhausen was posted to JG 27 in spring 1941. 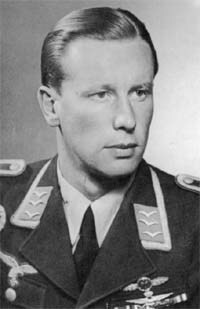 Unteroffizier Steinhausen was assigned to 1./JG 27. He was to be particularly successful over North Africa. He recorded his first victory on 9 June, when he shot down a RAF Hurricane fighter north of Tobruk. Steinhausen shot down a RAF Tomahawk fighter on 26 August for his fifth victory. It is thought his victim was the upcoming British ace Sergeant Maurice Hards (7 destroyed, two probable and 4 damaged victories) who force-landed, wounded in the leg on the Mersa Matruh-Sidi Barrani road. On 28 March, Steinhausen claimed his 10th victory, when he shot down a RAF Kittyhawk fighter near Tmimi. He shot down four RAF fighters in the El Adem area on 16 June (20-23) and claimed a further four on 28 June near Sidi Haneish (27-30). Steinhausen claimed a USAAF B-24 four-engine bomber shot down for his 34th victory on 9 July 1942. On 6 September 1942, Steinhausen shot down a Hurricane southeast of El Alamein. However, he was then shot down in Bf 109 F-4 (W.Nr. 13 272) “White 5”. He remains missing to this day. Steinhausen was posthumously awarded the Ritterkreuz and promoted to the rank of Leutnant on 3 November. Günther Steinhausen was credited with 40 victories. All his victories were recorded over the Western front and included one four-engine bomber.